Specials valid until May 31st, 2019.
inbox for exclusive, 1-day-only specials! At Martin's Rejuvenation Centre our staff takes pride in our role as leading experts and educators in the field of Aesthetic Medicine. When you come to Martin’s, you can trust that you will be treated with both expertise and artistry by any of our amazing, compassionate and dedicated staff. Our Injectors feel strongly about focusing on the GOOD in everyone. Rather than focus on faults, we help identify our clients’ BEST features and discuss how to highlight them while minimizing visual distractions. As a result, our clients typically feel refreshed and positive about themselves. Always working towards being, Younger Tomorrow! Martin's Rejuvenation Centre, for more than fifteen years, Dr. Martin also directs a training facility through which she teaches her techniques to other physicians and medical support personnel from around the world. Dr. Martin's Team including Christine (NP - Nurse practitioner), Krystal (RN) and Tiffany (RPN) are leaders and educators in the field of cosmetic treatments with botox and fillers. 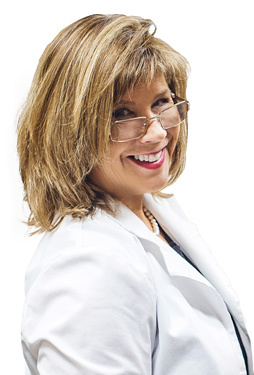 Dr. Martin and her team are highly experienced in the field of venous diseases. They will expertly evaluate the legs, provide valuable education, then decide which treatment option is best for a given situation. The options include sclerotherapy, compression therapy, laser or surgery. Sclerotherapy is a popular method for eliminating varicose & spider veins that has been in use since the 1920's. As part of our complete health approach to vein care, we professionally measure each of our clients for compression stockings. All of our staff are professionally certified fitters. Stockings are an integral part of treatment here at Martin's Rejuvenation Centre. We carry a complete line of compression stockings with variations in style and fabric that will be guaranteed to suit your lifestyle. Our stockings come in many different colors and styles. We have socks, pantyhose, thigh-highs in cotton, sheer and our new ultra sheer line. We are pleased to offer our clients the most reliable and effective technology in laser hair removal. Our 800 nm Diode laser offers a safe, fast and effective hair removal system. Unlike "IPL", a true laser targets all of its energy on its main function – the removal of unwanted hair. As a result, the treatments are more effective. This procedure involves the use of a laser that uses infrared light to heat the dermis of the skin. When the surface of the skin is cooled and the tissue underneath it is heated, this results in collagen re-modelling (tightening and thickening of sagging skin). This laser works best for mild to moderate loose skin which occurs in your 40's and 50's. Eyebrows help to accentuate a woman's eyes, and they also help to soften the overall appearance of the face; however, for many of us growing the kind of eyebrows that catch almost anyone's attention is simply beyond our grasp. Pigment is implanted between the first and second layers of the skin resulting in brows that will last you 1-1 ½ years. Thick, lush eyelashes help to accentuate a woman's eyes, and they also help to soften the overall appearance of the face; however, for many of us growing the kind of lashes that catch almost anyone's attention is simply beyond our grasp. We offer a prescription topical solution that is formulated to enhance the growth of certain kinds of hair follicles; resulting in thicker, darker, and longer eye lashes. The "AccelaFuze" Microdermabrasion Therapy System offers a wide range of treatment options within one machine. You can decide if you just want a good exfoliation or if you would like to follow that with an infusion of vitamins, minerals and all the nutrients your particular skin needs. This popular non-surgical treatment has many celebrity fans, including Oprah Winfrey who first tried the treatment in 2006! It's the treatment that will smooth and tighten your skin and it will continue to do its work for six months after. It's an insurance policy against aging without surgery. Platelet rich plasma (also known as “PRP” or Selphyl) is a specialized treatment that uses a portion of your own blood (plasma) in order to tighten and enrich skin tone and colour. Platelets found in plasma are rich in growth factors which have been shown to stimulate tissue repair, growth and collagen production.